The Devil’s Washboard, a group of three steep hills along Donmyer Road, has a harrowing history. Reports say that in the 1950s, seven local teens were racing in a car when they slammed into the bank, killing some or all of them. The wrecked car was placed upon posts at the site to remind other teens of the hazards of driving imprudently. The car was moved slightly from its original location in the 1990s, but is said to still remain today, crumpled upon the hillside. Some witnesses claim to have heard the phantom screams of the dying teens. We drove this road and when we got to the car our van made a very weird noise and my mother heard faint screaming. VERY CREEPY!!! My team, Ghost Investigation Crew, did the area 2 years ago. Night vision video around the car showed several shadow people and K2 meters were very active. Have visited this site. Out geocaching and paid a visit for there was a geocache to find. The access road is gravel/dirt and there ARE 3 hills at this site. Even knowing the story, approached area at a respectable speed, mainly because you can literally do a “Dukes of Hazard” here and go flying/bouncing down the road. While searching for the geocache, I had my cell phone turned off at time of visit. Cell phone suddenly TURNED ON by itself. May have been something “odd” or just the way I was stretching to retrieve the geocache for I probably grazed the ON button just enough with a body part. Supposedly, the wrecked car is still there and is supposedly a few hundred feet from the crash site – no longer propped-up like in the story. Unfortunately, I forgot about the vehicle and did not get a chance to explore. Since there a bunch of other geocaches in the area that I need to find, I plan on re-visiting this site again in the future. Your story isn’t quite true. Actually, the car accident was in the 1970s and no one was killed, but one teen was seriously injured and has to use leg braces and crutches to walk, even to this day (I think–I haven’t seen him for many years). It is true that the wrecked car was put up on a platform as a warning to other teenagers out joyriding. Not sure what your fancy equipment showed, but it wasn’t the ghosts of dead car accident victims. I’ve never heard of anyone being killed on Devil’s Washboard and my mother has lived in Gypsum for her entire life (and lives there still) and I lived there from infancy (1962) until I left for college (1981). Yes Lisa, that is the true story. My cousin was the boy that was seriously injured. He was thrown from the car and paralyzed, he’s been in a wheelchair ever since, he did use arm crutches for awhile. It happened in 1974 when he was only 16. The car has since been removed due to it’s total rusting out. Was stationed at Ft. Riley in ’86 and had a girlfriend from Salina. She took me out to the washboard and timed telling the story about the wreck and the placing of the car as a warning just as I topped the last hill. AND THERE IT WAS ON A PLATFORM. Creepiest experience I’ve ever had. Is it a public place to investigate or would I have to get permission? I was a long time gypsum and am all to familiar with the terrible accident that paralyzed one of my brothers best friends. There was another accident at the same site with several friends of mine, with 1 girl lopsing a finger. Not sure I buy anything of it being haunted, but for sure dangerous at excessive speed with car “jumping” the top of the hill. This picture was taken May 8, 2018 going North on Donmyer Rd. As a former resident and outdoorsman of Gypsum, I can attest this is one of most beautiful places in Kansas! 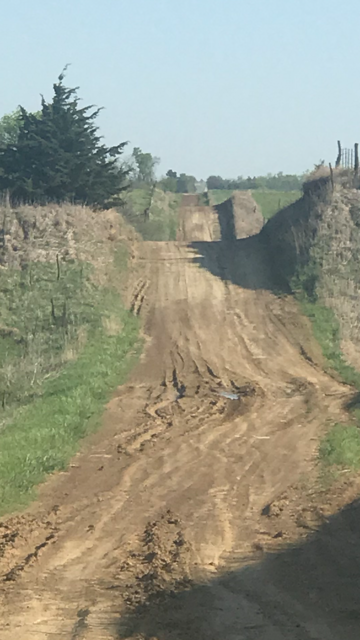 I grew up 4 miles south of Devils Washboard.I was far enough south to be in Lindsborg school district.Kids from 20 miles away in Lindsborg came out and ran it.It happened 1973 or 74, just after I graduated from high school.The road was kept up better then.You could jump, and land in the road.What is really amazing, is that there wasn’t a head on collision there. Lots of people did it.